James Earp was born in Ohio County on 28th June, 1841. He enlisted in the 17th Illinois Infantry in 1861 and was a member of the Union Army during the American Civil War. He left the army after being badly wounded at Fredericktown, Missouri on 31st October, 1861. Earp joined the rest of the family in Colton, California, before moving on to Helena, Montana. He also lived in Pineswell, Missouri and Newton, Kansas, before marrying Nellie Ketchum on 18th April, 1873. For a while he settled in Wichita before working as a deputy to Sheriff Charles Bassett in Dodge City. In 1879 James Wyatt moved to Tombstone with his three brothers, Virgil Earp, Wyatt Earp and Morgan Earp. Unlike his brothers, James was not involved in the events at the OK Corral. Morgan Earp was killed when he was playing billiards with Wyatt Earp on 18th March, 1882. Eyewitnesses claimed that Frank Stilwell was seen running from the scene of the crime. Three days later Stilwell's was found dead. A Mexican who was also implicated in the crime was also found murdered in a lumber camp. It is believed that Wyatt Earp was responsible for both men's death. 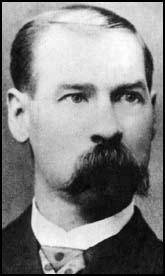 James Earp and Virgil Earp took Morgan's body to home of his parents in Colton, California, for burial. He later lived in Shoshone County, Idaho before settling in California in 1890. James Earp died on 25th January, 1926.